Thanks for the great kite instructions. We had a big kite flying event at the school and my son wanted a big kite that flew well. 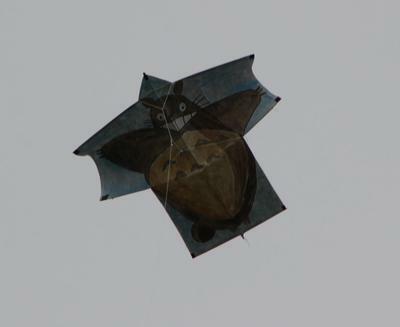 We decided to build the dowel sode kite, and kept with the Japanese theme painting the Totoro character on it from the Miyazaki movie. We bought a big sheet of tyvek from the internet which took the acrylic paint well. Other than that we followed the instructions on the website. The kite took off very quickly and was so stable flying. We only had 200 feet of string, and I was wishing we had bought the 500 foot roll before heading out. Thanks again for taking the time to make this great site. 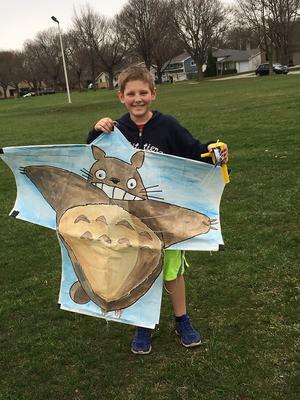 Great looking art job on that kite! Probably needs a tad more wind speed than my bag-plastic version, but yours should still have a good wind range anyway. Good on you for choosing something other than a Diamond or a Delta.